RTW Tailoring Sewalong #16 – Finale and Feedback! The buttons for my Anzac Coat are probably on a courier between Parnell and Ponsonby as I type! After a week-long delay due to the instantaneous death of my computer, grr, life is back to normal and soon I will have a finished coat. I ordered some antique brass military buttons, and should get the buttonholes done at work on Monday, and a finished garment post on Wednesday, which is about a month after Anzac Day, but never mind….. This button is what my great-great-grandfather would have worn when he joined the 58th Regiment back in 1841 – wouldn’t it be nice to have a whole coat of these?! There is really nothing left to do in the sewalong other than button and buttonhole our garments – and I’m presuming you know how to do that already – so this brings our RTW Tailoring Sewalong officially to a close! Once the buttons and buttonholes are done, I recommend taking your jacket to a trusted drycleaner for a professional press – it will add that final finishing touch and is well worth the effort. When your jacket is finished, be sure to let us know about it – leave a link in the comments or post some pictures in the Flickr group so we can all admire your hard work! And if you still have questions, it’s never too late to ask. I’d love to hear some feedback – let me know what you thought of the sewalong. Some of you have left some wonderful comments on the last post, but I take criticism too! What bits and pieces did you think were particularly valuable, and what bits and pieces did you dislike or would do differently? Fire away! Have a great sewing day – I’m off to hem some trousers….. So sorry about the computer malfunction. I had been checking every day to see your finished coat and just assumed you were extra busy. Those old buttons are nice and I agree, a complete set would have been fabulous to have on the coat. I think this is the best sew along for the quality of the content. Maybe, it was a bit too fast but that only my opinino and I know I am very slow. Unfortunately, I did not take part as I said I would but the jacket I was already making took much more time than I 1st thought with all the changes and tailoring techniques that I added in the making and that were not intented at the begining. Now, summer is on it's way and I feel more like sewing dresses. This jacket will be for next fall. The things I want to practise is tracing the pattern with seam allowances and marking without thread tracing. I can't wait to see you with your anzac coat on. Sherry – thank you so much for doing this sewalong. Thank you for being so generous with your time and your knowledge. The sewalong was amazing and I picked up so much new information. Not knowing the norm for sewalongs (this is my first participation) but I would have like some sort of timeline. In the sidebar or as one to the first sewalong posts. I have photos on my blog, I am not sure how to post in Flickr, will have to investigate. What an amazing button! A legacy button. Your sew along has been amazing. Packed with so much info that I couldn't take it all in. But, I did manage to use a lot of your tips and it definitely made a difference. I am not finished yet, but it is turning out to be the best jacket I have made so far. I hope you will be able to leave all your sew-along posts up for good, so I can continue to refer to them int he future. Hi Sherry – your sewalong has been fantastic in every respect. You have been incredibly generous with your time and knowledge. I have learnt so much, as this was my first coat and sewalong – coat should be finished this weekend. That button is amazing, as I'm sure was the person who wore it. An amazing button. My first Sew A Long too – nothing at all to criticise. Will you do bound buttonholes? Should they be done before the front facing is attached? I've said lots of thank yous previously – but happy to say it again – I've learnt heaps – thanks!!!!! Yeah, blogger has been very annoying …. Darn. Lost last comment so second time lucky. Sewalong very helpful. I only did a lite version because i was too lazy to retrace the pattern and the different seam allowances caught me out in a couple of places. Thank you for taking the time to share your expertise. You've lifted our game, and that is a great gift to the home sewing community. In the 1st comment I said, Sherry is the best sew along I've seen. And this is utterly sincere. You did so much. Thanks again. I did not take part as I said I did, but I'll use all you knowledge in a future jacket. As summer is approaching I feel more like sewing more summery dresses. As far As I am concerned the pace of the Sal was a bit too fast for me, but I can be very slow, that the only “criticism” I can make. But I am affraid I am the one to be incriminated. This has been an amazing sew along for me. My jacket is almost complete. Since I have been only sewing for a year and haven't taken any classes this has greatly improved my overall sewing skills. I now add the 1cm seam allowance to everything and love being able to just line up and sew. I was also worried about setting in my sleeves, but through your guidance I was able to set them in without puckers. I was shocked and so excited! I feel like I can tackle anything now. Thanks for a really good sew-along. It has been very helpful. I had heard about most of tips and techniques you have described here, but it is great to have it all down at the same place and described as a process instead of just picking up bits and pieces from books and blogs. I am not finished with the jacket yet but that is totally my own fault – the speed of the sewalong was very suitable for the type of project. The only problem, I had, was that I found the posts about pattern alterations a bit overwhelming. Those posts seemed so packed with information. I don't have any good suggestions for how to do it differently though and it is only a tiny problem in an otherwise really good sewalong. Many thanks. Thank you Sherry SOOOOO much! I just finished my coat and am like a little child at Christmas! I posted some pictures in the Flickr group, as well as even more on my blog… There is nothing to criticize at all, and you probably noticed how few questions we all had along the way? Well, because your explanations and pictures were absolutely fabulous. If you ever do another sew-along, count me in – I don't even care if it is for oven mittens! Hello Sherry I am a bit like Marie in that I have finished the coat and you can see it on my blog but dont know how to link it to Flicker . I am a bit challenged when it comes to this stuff . I have really enjoyed your help and when my son girlfriend is free I am going to get her to help me with getting the links etc happening . I also want to post on pattern review. I think you will have read my thoughts on your sewalong and thoughts about taking it further . I would p[ersonally love something on bagging out a skirt with a facing and an invisible zip . Do you ever bag out a skirt?? Dear Sherry, thank you so much for your time and expertise in creating this sew-along. I did end up finishing a jacket, which I will wear and photograph tomorrow! and not the one I had originally intended to make! Your jacket is amazing. So beautifully finished, and the buttons are gorgeous. Well done on an amazingly successful sew-along! Sherry, your Sewalong has been really wonderful. I've learned a lot, and you've made it all feel possible! I'm just going to attach the 2nd sleeve, then the lining tomorrow…it's been slow going!! But I'll get this jacket finished, and am going to make a 2nd variation in another type of fabric; I spent so much time altering the pattern I feel I want to make the most of it. Thanks again, I love following your blog, and I'd love to follow any of your future sewalongs! Sherry, firstly, your coat has turned out beautifully. Secondly I want to thank you so much for running this sewalong. I've learned so much, and I'm delighted with my finished jacket. It's taken me a long time to complete, but everything you've shown and explained in your tutorials has worked out beautifully. I've uploaded finished photos on the Flickr group. Thank you for taking the time to do this sewalong and for being so generous with your knowledge. Can't wait for the next sewalong (no pressure lol). I love your Latvian mittens by the way! I finally posted photos of my coat on flickr. I have been getting so many compliments. Thank you so much for all of the work that you put into your sew-along! Hey Sherry, I just made another project, a blazer for my mother, using this sew-along. It is simply perfect and I will come back and refer to it every time I make a coat or jacket for sure! I'll post pictures in the flickr group, and you can come look at my blogpost if you want! All the best to you, and thank you again! I am very grateful to you for sharing your knowledge and expertise free, just for the love of sewing. 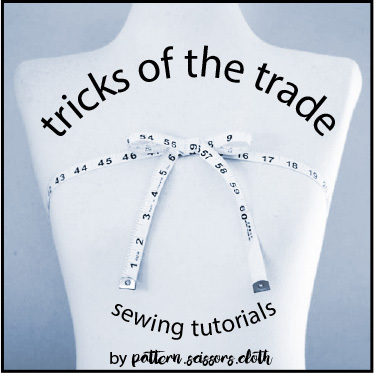 I have been sewing for about 40 years and I am still not an expert and blogs like yours are a real encouragement for ones who just want to be better at what they love to do. Your finished projects are very good indeed and I hope to make myself a wardrobe of equally lovely clothing for myself and my daughter, the 17-year-old! Thanks for peeps such as you! Thanks so much for your lovely comment caje! It is peeps like you that keep me blogging! This post is almost 3years behind all the others, but I have to express my appreciation for your hard work as well. I have been tailoring for about 13 years (shirt making first, then tailoring), and I am making a few suits for my son and a few friends. Due to time constraints, the full bespoke processs isn't feasible. This rtw sew along will help me not just on this project, but for years to come. Again thank you so much for sharing your expertise. Thank you so much for having this blog. You are so knowledgeable and so very generous. I'll be attempting this in a few months.